Prof. Sam Keene and three EE undergraduate students, Brenda So, Cory Nezin, and Vishnu Kaimal, recently published a paper titled, "Estimating The Electricity Generation Capacity of Solar Photovoltaic Arrays Using Only Color Aerial Imagery", which was accepted for inclusion as an oral presentation in the IGARSS 2017 program. In this work, the problem of developing algorithms that automatically infer information about small-scale solar photovoltaic (PV) arrays in high resolution aerial imagery is considered. Such algorithms potentially offer a faster and cheaper solution to collecting small-scale PV information, such as their location and capacity. Existing work on this topic has focused on the automatic identification and annotation of panels in the aerial imagery. We extend this work by showing that we can reliably infer the capacity of PV arrays given only (i) color aerial imagery and (ii) a precise annotation of the array location. 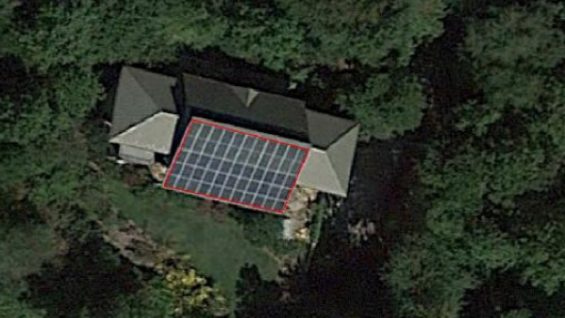 First we demonstrate that accurate capacity estimates can be obtained simply by estimating the visible surface area of a solar array, regardless of tilt. We then build a more sophisticated model where we use additional image information related to the properties of the solar array to further improve the capacity predictions. We use a dataset of 362 manually annotated Google Earth mages of solar arrays with known electricity generation capacity in North Carolina to measure the predictive performance of our models.